Quick Attack Foam Cart - SOS Safety International Inc.
More than a portable monitor, the Quick Attack foam cart can easily be operated by one person. 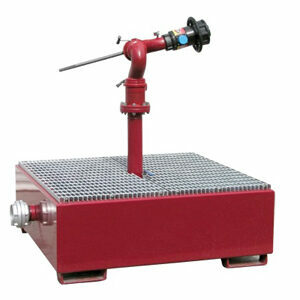 Ideal for spill fires in chemical plants and flammable liquid storage areas. 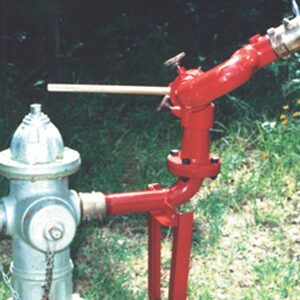 A single mobile unit can be used to protect several different remote hazard areas. More than a portable monitor, the Quick Attack foam cart can easily be operated by one person. 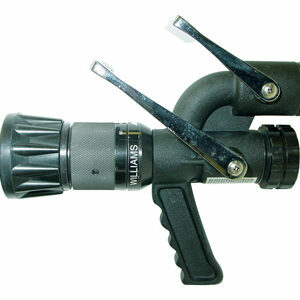 Ideal for spill fires in chemical plants and flammable liquid storage areas. A single mobile unit can be used to protect several different remote hazard areas. 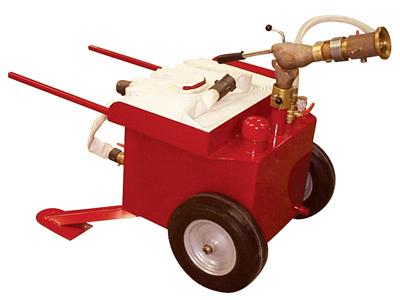 Unlike eductor style foam stations, this foam cart operates effectively and proportions foam even at low water inlet pressures. Minimum recommended inlet pressure is 70 psi (4.8 bars). Foam stream projects from monitor approximately 50’ (15.2 m) at 70 psi (4.8 bars) inlet pressure (straight stream in still air). Orifice plates for 0.5%, 1% and 3% proportioning rates are included. Stainless steel 35 gallon (132 L) capacity foam concentrate storage tank is fitted with fill opening, pressure vacuum vent and drain valve. Red vinyl Quick Attack cover is available as an option.